Many sportsmen believe that excess predator's and extreme pro wolf biologist's should go first! This is the longest response I’ve ever made to a big game management proposal that I don’t think should have ever been written, (At least at this time). In fact I believe it is a complete waste of time and is biologically and fiscally irresponsible. It is past time that the IDFG recognizes and admits the truth of the negative impact wolves are having on our back country elk populations. It is past time that IDFG prepares and executes a comprehensive predator management plan similar to the time and resources exhausted on this elk management plan that will succeed in rebuilding our back country elk populations. It is past time that IDFG goes back to counting elk every 2-3 years for each unit as they used to do before wolf re-introduction so they have a clue how many animals are on the ground! Two years ago IDFG commissioners requested IDFG staff to prepare a comprehensive predator brochure for the state. When staff finally completed the last revision, the plan appears to be just a couple of pages to appease the environmental community. World renowned wolf expert Dr. David Mech has admitted, "That to hold a wolf population stationary it requires an annual take of 28-50% per year." Even IDFG’s own 2011 Idaho IDFG Predation management Plan for the Lolo and Selway Elk Zones that isn't being followed claims, “Wolf removal rates of 30-35% or less typically do not cause any long-term changes in wolf abundance, while sustained removals of 40% or more may cause long-term reductions.” Dr. Mech also stated that “Normal regulated public harvest such as is contemplated in the NRM is usually unableto reduce wolf populations.” Biologist Mark Boyce wrote,“That in areas where wolf hunting and trapping is allowed wolves become wary and more difficult to kill.” He continues, “This wariness makes it more difficult for removals by hunters and trappers to have a substantive effect on wolf populations.” In other words we know hunting and trapping alone will not provide sufficient results to rebuild our elk populations in remote back country locations. Where is the IDFG strategic predator plan to accomplish this criterion to rebuild Idaho’s elk? We are approaching winter where wolf control is the most effective time and we only have a limited window of opportunity. How many dollars have been allocated to reduce the backcountry zones by 50%? I honestly believe this entire proposed elk plan is just another desperate effort to increase IDFG revenue by selling more elk tags which will result in severely impacting our struggling elk populations. I wish to thank all of the IDFG commissioners for their efforts and hard work for Idahoan's. 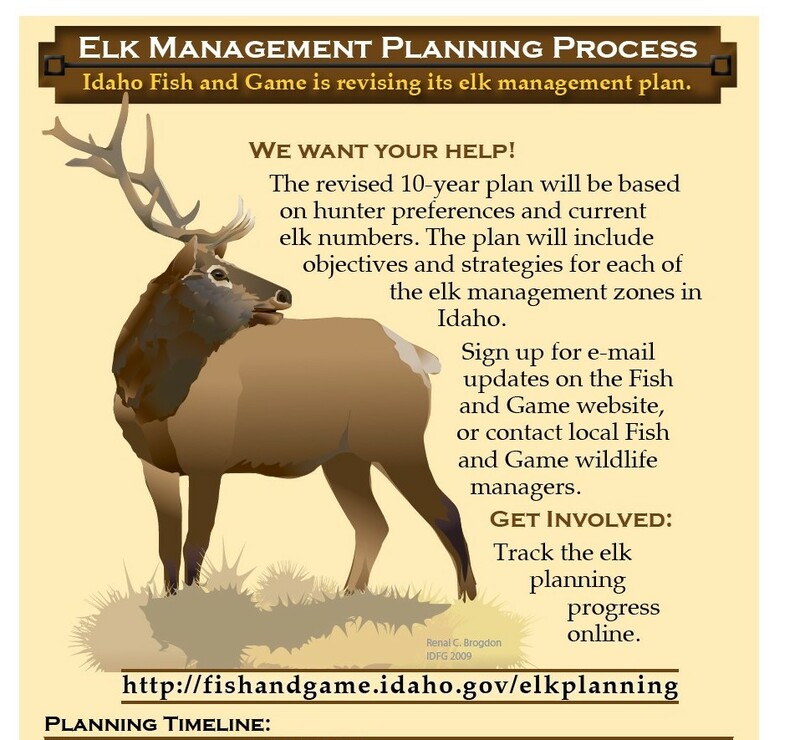 This proposed elk management plan process increases my appreciation for the commission based Fish and Game decision making process in Idaho. Common sense and sound judgment must continue to maintain a strong precedence in all Wildlife management decisions in Idaho. The damage incurred to Idaho’s backcountry elk populations due to failed academia Science cannot be underscored. It is refreshing to see, (at least in writing), that the dept. is not claiming their primary goal for elk management is to “Manage for Non-consumptive purposes”, which was found in previous elk plans. IDFG biologists and wildlife managers truly accomplished their past goal of managing elk for non consumptive purposes. I hope their environmental partners and the wolves truly appreciate the outcome. I can attest that sportsmen will never forget this great environmental experiment gone bad that was accomplished with their funding and at the sacrifice of winter meat and lost hunting opportunities with family and friends. My hope is we never repeat these same mistakes again and we allow common sense and practical application to prevail over a bankrupt academia environmental agenda. I truly appreciate those commissioners that are standing up for Sportsmen throughout the vetting process of this new elk plan. One of the most negligent management practices of IDFG has been not proactively and consistently monitoring Idaho’s elk populations. In the proposed Idaho Fish and game elk management plan, the very first sentence in the initial plan read:"The revised 10-year plan will be based on hunter preferences and current elk numbers." We wrote a letter to IDFG commissions about this ridiculous claim and fortunately someone finally removed this disingenuous claim but this triggered concerns about the credibility of this new plan. My first question is how can a projected 10 year elk management plan be based on current elk numbers if IDFG doesn’t have current elk numbers? We have observed drastic elk number decreases in most of our backcountry zones with high wolf density. In fact many zones have not been counted for 4-5 years. Example; the Selway zone which is in ground zero of wolf country has not been counted for 7 years! How can you manage for current elk populations with data from 2007? As an example comparing the last elk count in 2007 to the previous count of 2004 in the presence of high wolf density, the calf elk population dropped by 50% in just 3 years! (Click here for the 2007 Selway count). 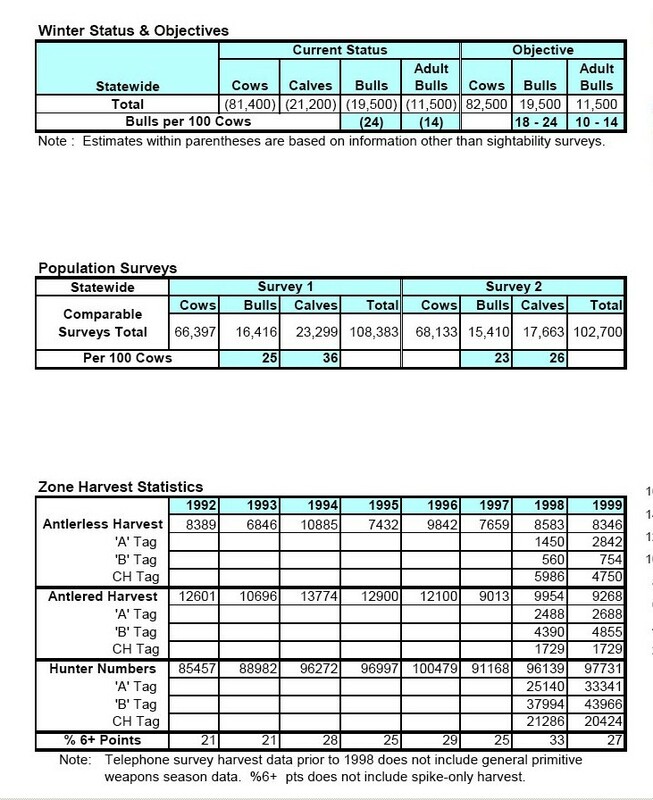 In the January 1999 elk plan it states the following: “Overall, elk populations statewide are near all time highs.” Currently IDFG is claiming we have 107,000 elk in the state. According to IDFG, this is almost identical to what Idaho had back in 1999. One 1999 survey shows 108,383 andanother 102,700. How is this possible? Did Southern Idaho elk populations grow that much since 1999? Idaho Sportsmen can attest which direction the elk population has gone in most of our country north of Boise since 1999 and it isn’t upward or very positive. Again look at the harvest data and lack of proactive counts and decide for yourself if this is a credible statement. Back in 2007, Ecologist Dr. Charles Kay informed us that Canadian biologists had learned that blaming habitat in high wolf density regions was futile. Dr. Charles Kay put me in touch with Canadian biologist Cliff White who provided me with elk data from Banff National Park. Mr. White emailed me elk count data from Banf where elk are not hunted that revealed a drastic decline in elk. After years of Canadian control measures to eliminate wolves, Banff had its first re-established wolf pack in 1986. (Click here for the Banf elk data)that closely models the downward trajectory of the Lolo, Selway and other Idaho backcountry elk zones. I understand the positive effects of the 1910, 1919 and 1934’s fires (and no wolves) in creating the once famous elk population in the Lolo. Contrary to the enviro’s and IDFG’s claims that Lolo elk numbers were experiencing a steep or even slow decline in numbers due to habitat conditions the real data suggests a completely different story. A 22-year Clearwater Elk Ecology Study (1964-1985) proved the elk in the Lolo were only consuming 25% of available winter forage. IDFG blamed poor calf recruitment on having to many old cow elk in the Lolo so they increased cow tags significantly. In my opinion, the reason the calf recruitment was low was uncontrolled predators, primarily black bears, were killing too many newborn calves. Bear and wolf loving biologist Steve Nadeau had even closed the fall black bear season in the mid 1990’s because he was afraid to many mature boars were being taken! Also recent studies (2006), showed no indication elk populations were being negatively impacted by poor habitat. The 1994-1995 IDFG aerial counts of the Lolo Zone showed elk numbers stable and or increasing! The truth is the Lolo had ample habitat and still does. The terrible winter of 96-97 produced over 200% snowpack in the upper Lolo zone and that one year cut the Lolo elk numbers by 50% or greater. IDFG director Jerry Conley blamed the winter kill of 96-97 to just poor habitat even though the elk’s habitat was covered up with snow for 6 months! No doubt that the poor calf recruitment was due to unmanaged bears. In my opinion, this one terrible winter precipitated the Crapo elk initiativewhere Senator Mike Crapo brought groups together to work on projects to stop the declining elk populations. Below is the IDFG Lolo elk population data from 1989-2010. In unit 10 the elk count went from 7,745 in 1992 to 9,729 in 1994! Unit 12 the elk count went from 3,763 in 1989 to 3,832 in 1995.Due to uncontrolled wolf populations and the rugged terrain and remoteness, the Lolo elk population will never recover unless IDFG finally decides to aggressively control wolves and bears. In IDFG director Virgil Moore’s opening letter introducing the new elk plan, he states in the very first sentence that,“When I became director of Idaho Fish and Game in 2011, I said elk would be a top priority during my tenure.” I challenge this statement that elk was a top priority for director Moore’s agenda. Every article I’ve seen or can locate in the media regarding Director Moore claims when he was first appointed as director was involving holding a, “Wildlife Congress,” which was changed to the, “Wildlife Summit.” In my opinion, Director Moore’s obsession with the Wildlife Summit has done more damage to the credibility of IDFG than any single event since the department's illegal participation in wolf -introduction. In the January 6, 2012 email below, director Moore promises RMEF president David Allen that he would include Mr. Allen in the Wildlife Summit agenda development and that he would get back to him. Director Moore not only didn’t keep his word about getting back to the CEO of RMEF as promised but never included RMEF or any traditional sportsmen’s groups in the Summit agenda. The only participants in the summit were environmental groups and individuals. When IDFG announced the Wildlife Summit in CDA in September 2011 they initially told the commission the following, “We've tried hard not to miscommunicate at this early stage that this is simply a means to raise more revenue." “Specifically at this point we have ongoing outreach efforts as we speak; we've been talking to and working with representatives among the wildlife conservation oriented non-governmental organizations. ISCAC has been a great one, a partner with us to make discussions as have Nature conservancy and the Idaho Conservation league." Now the Dept. is claiming in a recent article,“As far as trying to find non-consumptive funding, that was never the overall plan", and "the summit was meant to renew enthusiasm for wildlife. "My question to Director Moore is if elk hunting was a top priority of yours as a director and you're wildlife summit goal was all about, “creating a renewed enthusiasm for wildlife”, then why didn’t you include RMEF or any traditional hunting organizations in the agenda planning process of the summit? Why didn’t you “, get back to,” and invite a traditional sportsmen group leader to speak such as s David Allen instead of just environmentalists? IDFG reaches out to Western Watersheds leaders and other radical environmentalists during the Idaho Fish and Game Wildlife Diversity meetings being held statewide. Recently KAREN BUDD-FALEN from the Budd-Falen Law office in Cheyenne, Wyoming released a MEMORANDUMthat Western Watersheds has issued at least 675 Freedom of Information Act (“FOIA”) requests just to the BLM and Forest Service, related to livestock grazing on public lands! Karen also released a SECOND memorandum how Western Watersheds and other radical anti-ranching environmental groups are using taxpayer dollars through (“NEPA”) "as the litigation tool of choice,” to follow through with their, “to do” list, to,“Get all cows and sheep off federal lands ASAP!" Over 400 federal court complaints were individually analyzed and filed by either the Western Watersheds Project (“WWP”), WildEarth Guardians (“WEG”) or the Center for Biological Diversity (“CBD”). Idaho For Wildlife’s web page entitled, “Why Sportsman don't trust the science and credibility of many state and government Biologists,”explains why many Idahoan’s are apprehensive that rebuilding backcountry elk zones can become a reality due to the current radical environmental mindset of many of our biologists and wildlife managers. Commission request ignored by the Department involving telling the truth of IDFG's illegal participation in wolf re-introduction. As mentioned above it is a fact that oftentimes sportsmen clearly have acquired knowledge that IDFG staff has kept from IDFG commissioners. In the February 2010 IDFG commission meeting in Boise, IDFG commissions complained of sportsmen who were constantly speaking erroneously and providing, “misinformation,” during public testimony. These complains were regarding “rumours” and “conspiracies” of how IDFG had illegally signed documents allowing wolves to be brought into Idaho. (Click here for the recording). Former Idaho legislator and current IDFG commissioner (at the time) Cameron Wheeler took the time to educate the commission how this “conspiracy” actually did occur and how IDFG “Cooperated with the introduction of wolves in opposition from "legislature, the governor and the commission itself." He states “It’s been a tough pill for them,(sportsmen) to swallow and they ,(sportsmen) paid a "heavy price for this. "Commissioner Wheeler continued and said, “It’s a fact and needs to be ceded and its had a lot of impact on this dept.” IDFG commissioner Randy Budge indicated that if the information that Cameron was sharing was factual, that wolves were introduced over the objection of the governor, commission and legislature then this ought to be in included in the fact sheet. IDFG commission Chairmen Wayne Wright asked that all of the facts come forth on this fact sheet and that “more disclosure might be better and that they should state all of the facts.” IDFG director Cal Grown was asked to comment and he stated he wanted “full disclosure” and “that letter’s is going to cause us problems for a long time." He continued, “It’s open I have it, I asked the previous director why did you do it," "That letter when you start talking about it, it gets deeper and deeper." Director Groen mention the permit that was also signed. “It’s difficult to discuss it, it’s there , I have it, I can give you the letters." Chairmen Wright stated, ”I think that history would be real helpful if we (the commission) all knew exactly what happened." The decision was made to put a wolf re-introduction time-line on the IDFG website and make it available to the public. Jim Unsworth commented that they could create a “Sunshine history” of wolf introduction and that’s exactly what they did! In this link to the wolf re-introduction time line, IDFG staff went to great efforts to create and develop this time-line for the purpose of "Full disclosure." The dept. posted links to the illegal letter and permit but they omitted everything else that the commission wanted for transparency and "Full disclosure" regarding IDFG's involvement in the introduction. Nothing in this "factual" time-line was ever written how IDFG's participation was accomplished over the objection of the governor, legislature and commission. Click here to learn more about the illegal re-introduction of wolves into Idaho. In early June of 2013, David Allen the president of RMEF phoned me indicting he was very frustrated with IDFG as they were dragging their feet on accepting $50,000 for free wolf collars. RMEF recognized a legitimate high risk threat for Idaho due to not having enough collared wolves on the ground. Mr. Allen was concerned that as of this Spring, IDFG had only about 40 collared wolves in the state. If Idaho cannot substantiate it has sufficient wolf numbers this could risk a review and potential relisting of the wolves by the Feds and we could lose state management. One long-term very knowledgeable legislator assumed the reason IDFG was against accepting the wolf collars is because this would result in more dead wolves. In fact “Wolves of the Rockies” spokeswomen Kim Bean said “wolf advocates would never buy tags because they fund only collaring and lethal control." I’m guessing the dept. is also against spending the $ to collar wolves because they can gain traction by claiming they are low on funds and will use this as another “Sequester” political posturing tool to scare legislators into giving them another fee increase for 2014. We had to contact the office of species conservation, legislators and IDFG commissioners before IDFG would finally accept the $ for these collars. To overcome the spending excuse to trap wolves to be collared, volunteers have agreed to trap the wolves for free but IDFG officials have refused this offer. This resistance to accept this $50K from RMEF and not having more collared wolves clearly raises red flags. Some may question is the motive purely environmental as Director Moore has been attempting to appease these groups in order to secure alternative funding? Click here for a letter I sent to former IDFG director Cal Groen charging IDFG with gross negligence for their terrible elk mismanagement during the winter of 96-97. This letter provides documentation that IDFG not only denied there was a serious winter kill in 96-97, but their science claimed the winter was just a “Normal" winter. The letter also contains evidence that the dept. doctored up a phony elk count in the spring of 1997 claiming the elk were doing fine! Then we learned that this phony 1997 elk count and study was developed on a computer! This letter was sent to Director Groen explaining to him why we chartered a winter flight into the Lolo during the terrible winter of 2007-2008 and that we did not want another repeat of their gross mismanagement like what occurred in 96-97. We knew during the winter of 2007-2008 that IDFG was not going to do anything to save our elk in the Lolo by being proactive responsible managers. From the time period of the 96-97 winter kill to 2007, we had learned a lot about IDFG’s environmental agenda to place wolf recovery over consumptive elk hunting. We knew this agenda also included not providing emergency winter feed to save starving elk in order to keep them “Wild” and concerns of cutting into their budget. There was a provision in the 1984 emergency winter feeding law that allowed the winter feeding $ to be funnelled back into the IDFG general fund if the money wasn’t used. The non/anti-hunting environmental groups and some of their allies within IDFG despise winter feeding elk. By pretending to be inept or incompetent about the terrible winterkills threatening Idaho's big game, the department could avoid being held accountable for breaking Idaho law requiring them to provide emergency winter feed. Click here to read more about how IDFG has been neglectful to provide emergency winter feed in many other areas of Idaho. (Click here)to read the following news article, where it states, “Some biologists and conservation groups question the science behind the plan,” (To remove the 43 wolves in the Lolo). Those biologists worked for IDFG and most still do. In fact current IDFG Deputy Director Jim Unsworth was quoted in this article when he was the Wildlife bureau Chief that, “When you have great habitat," he says, "predators aren't an issue." In fact Doctor Unsworth and Suzanne Stone of Defenders of Wildlife closely echoed the same conclusion why the Lolo elk populations were dropping in the Lolo. The IDFG proposal to kill 43 wolves in the Lolo in 2006 never happened because IDFG “Science” was written that “Habitat” was killing off our Lolo elk! Ed Bangs explained this to me in an email. (Click here).He wrote that the USWS had specific language written in the 10j rule that if “Predation” was the primary factor that was negatively impacting elk populations then the state could implement the 10j rule and provide wolf control to save our elk. Instead IDFG biologists wrote that habitat was the primary cause of the elk number decline in the Lolo which nullified the ability to use the 10j rule to remove the 43 wolves. What is ironic is that both Ed Bangs and David Mech believed at the time of this 2006 study that the Lolo was at or near the Peak of wolf density and saturation levels. It was also at this time that we were seeing wolf killed elk very frequently in the wintertime in the Lolo. Had this been an honest study and we could have utilized the 10j rule, this would have tremendously helped our Lolo elk population. Doctor Unsworth also claimed at the bottom of the newspaper that, “Reducing wolf predation through aerial gunning and trapping says Unsworth, is, “the last tool in our toolbox." 2-2008 Orogrande creek slaughter article. Due to the IDFG closing the primary North Fork of the Clearwater Road in the Lolo due to “Concerns over snowmobilers harassing elk," concerned sportsmen took 4 more trips to document more wolf predation. This all occured in just one small tributary of the North Fork of the Clearwater called Orogrande creek. These trips were from Feb 28 – Mar 9th of 2008. 3-13-2008 Dr. Proffessor Jim Peek writes article in the Lewiston Tribune, “Nothing goes to waste in nature”. This gem suggests how scavengers benefit from eating surplus killed elk. No doubt to the timing of this article as it coincides with IDFG’s propaganda machine to marginalize the devastation occurring in the Lolo. Dr. Peek was very instrumental in wolf introduction and was IDFG deputy director Jim Unsworth’s college professor. Dr. Peek worked with and advised IDFG and the environmental group called the wilderness Society simultaneously all through wolf re-introduction. No conflict of interest here! Professor Peek was recently used as the expert witness and authority in the law suit against the IDFG by Western Watersheds, Wilderness Society and a host of other environmental groups to keep IDFG from using helicopters to radio collar wolves in the Frank Church Wilderness! Professor Peek is responsible for brainwashing many of IDFG’s brilliant biologists on the innocence of wolves! Dr. Peek also recenlty has been working with IDFG on their Wildlife Diversity team in search of alternative funding. What this translates to is that when past IDFG director illegally signed the permit and letter to physically allow the Feds to bring wolves into Idaho, this expedited wolf recovery in Central Idaho by 15-20 years! Or from a sportsmen's perspective this illegal act by IDFG destroyed elk hunting 15-20 years faster than the preferred plan of Natural colonization from Canada. In fact it is possible to have circumvented much of the damage caused by wolves due to the fact that Idaho would have had 15-20 more years to work on wolf delisting and state management. What is ironic, is that wolves were not rapidly moving down from Canada as quickly as expected. While Central Idaho elk were being destroyed by wolves, elk hunting and harvest actually was increasing in some units of North Idaho during the same time! It wasn't until approximatly 5 years ago that the Panhandle elk populations began to be negatively impacted by wolves. 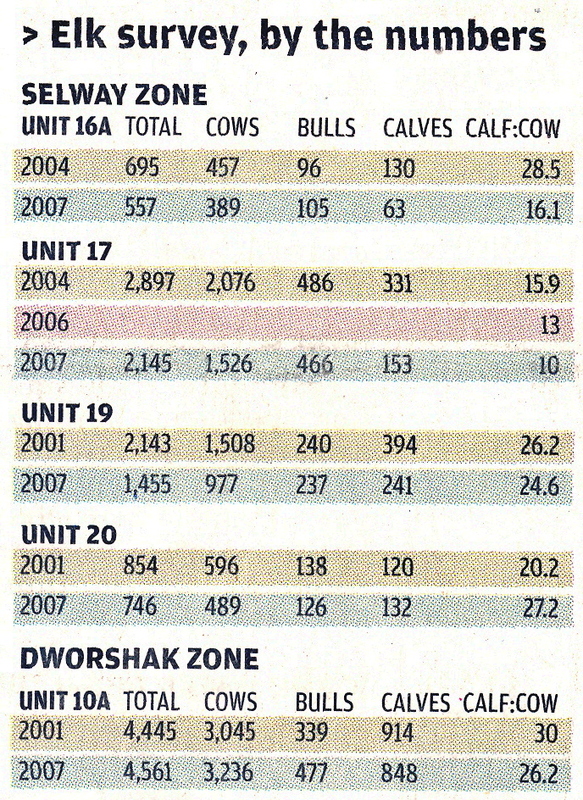 These units had an open cow season until 2012. Due to the "Insertion" of wolves facilitated by IDFG, elk numbers in Central Idaho wilderness and backcountry units dropped rapidly and then began to spread outside. This is why Idaho law and policy makers objected to this "Hard Recovery" plan that they knew IDFG wanted instead of "Natural Colonization." Due to the special permit and letter that IDFG illegally signed this allowed the USFWS to not only bring in the initial wolves in 1995, but gave them the authority “Translocate” additional "Problem" wolves all over Idaho’s back country. In fact the USFWS translocated 117 wolves into then NRM from 1998-2001 and many of these additional wolves were released throughout Idaho’s elk rich backcountry devastating these elk populations. In the state wide management section of the 2013 elk plan proposal, IDFG staff dedicated 6 full pages (30-36) to diseases that can impact elk. Just as IDFG failed to listen to Canadian experts on the damage wolves would inflict on our elk populations until it was too late, we are seeing IDFG once again following the same course of inaction regarding the threat of Echinococcus granulosus now found rampantly infecting our elk in the form of Hydatidcysts in wolf country. We have photos of elk lungs on our website of many infected elk where their lungs were almost completely destroyed by Hydatid cysts chock full of thousands of tape worm heads. Some bull elk are not acting normal or even wild when hunted. Some bulls are staying down in the valleys during the fall and easily shot. When some of these elk have been field dressed, the lungs are almost completely destroyed by Hydatid cysts. This explains why these bulls are not running away and or heading for the high country. Even Ed Bangs knew E.G. was going to be more of an issue in elk when he sent me an email in January 2010 stating the following: “However I believe there is no doubt that wolves have speeded up the transmission cycle in wild ungulates. "This is the tapeworm that causes visible cysts in lung of wild ungulates.” Not surprisingly, IDFG did not list Echinococcus granulosus (E.G.) even once in their 2013 elk plan as a disease of threat for elk. Seven years ago, (2007), IDFG discovered 66% of Idaho’s wolves tested positive for E.G. Now almost every recent wolf necropsy tested positive for E.G. Just in the Salmon, Idaho valley alone, Idaho For Wildlife has sent in 11 wolves for testing and 100% of the necropsies tested positive for E.G! The threat to humans is also being minimized by IDFG. Please review our wolf disease section of our website for more information. IDFG, follow your own plan! (click here) Page 8 reads: "Sport harvest is IDFG’s primary tool for predator reduction in the Lolo and Selway zones. IDFG may authorize agency control actions on predators where hunter harvest does not sufficiently reduce predation impacts." Sportsmen apathy needs to stop!We all need to get more involved communicating to our commissioners and legislators about our concerns with the direction of our future with elk hunting and management. We need to remember that in the original USFWS EIS statement from 1994, we were sold that," A recovered wolf population in the central Idaho area would kill about ten cattle (1-17), 57 sheep (32­92), and up to 1,650 ungulates each year. A recovered wolf population will not affect hunter harvest of male elk but may reduce harvest of female elk 10%-15% and will not measurably impact hunter harvest of deer, moose, bighorn sheep, or mountain goats. A recovery wolf population will not measurably impact ungulate populations in central Idaho." Concerned Sportsmen put up the funds to build Idaho’s elk populations in the 1930’s. Now it appears we are going to be forced to do this again because of IDFG’s refusal to spend our $ to control predators. Sportsmen have finally resigned to the fact that IDFG will not control wolves in the back country to save their elk and our coughing up their own funds. A relatively new group in North Idaho named Foundation for Wildlife Management is attempting to collect donations to help reimburse up to $500.00 per wolf for trapping expenses. This is all due to Director Moore not making back country wolf control a top priority to save elk. Most trappers have found they cannot afford to trap wolves in the backcountry due to high fuel and other costs, so wolves remain out of control. IDFG allocated only $50,000 out of their $94,000,000 + budget for wolf control this past year which is actually an insult to license purchasing sportsmen of Idaho who truly care about restoring elk populations. My question to director Moore is how can you rebuild elk populations in the back country if you won’t make it a fiscal priority? You told us two years ago when you’re budget was $20,000,000 less that you had plenty of $. Isn't it amazing that we can afford to buy what we want and that which meets our values? Many of IDFG studies are, "over the top", regarding environmentalist. Climate change and a pro predator agenda driven studies are rampant within the dept. Consider hiring a legislative led external efficiency consultant team to analyze all of IDFG’s programs and expenses. Ascertain what studies are crutial, relevant and meet Idaho's legislative charge and direction. Determine if some projects and programs can be eliminated. Look for opportunities to increase funding for predator control to rebuild elk herds. Get IDFG staff off of radical environmental boards and groups that propagate climate change and Landscape conservative cooperates that are consistent with the YTY initiative. The time and $ that was wasted in the Wildlife Summit and this proposed elk management plan are both good examples.